Barcelona’s Smart City Expo World Congress (SCEWC) came to a closure on Thursday, this time with a record-breaking 21,331 visitors, a 17% rise since last year. This year 844 exhibitors gathered at the trade fair dedicated to urban innovation, with more than 400 speakers and representatives from over 700 cities worldwide. 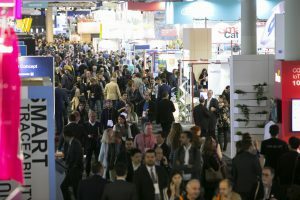 Constantí Serrallonga, the director of Fira de Barcelona, the trade fair institution hosting the event, said that the SCEWC ‘strengthened its position as the world’s leading event’ in the field of smart cities ‘year after year’. Serrallonga praised the SCEWC for ‘contributing to display Barcelona as a city that favors innovation and technology at the service of urban life quality’. This year Singapore was given the Smart City 2018 award for a project transforming the city into a global example of smart urban solutions, including dynamic algorithms planning the routes of public buses and systems detecting water leaks. Among the global companies with a stand at this year’s edition were Bosch, Cellnex, Huawei, Indra, Mastercard, Microsoft, Nec, SAP, Siemens and Suez. This year’s edition focused on five main issues facing cities: Digital Transformation, Urban Environment, Mobility, Governance & Finance, and Inclusive & Sharing Cities. What’s more, the particular focus for 2018 is local people and what makes a city livable, taking in such issues as the effect of gentrification on neighborhoods and how sharing can make cities more sustainable, resilient and inclusive.